Nomad­ic cul­ture leaves a deep and col­our­ful imprint on Euras­i­an his­tory. Nomad­ic empires first arose as shad­ow empires in response to the cent­ral­isa­tion of China accord­ing to one of the main aca­dem­ic debates. On the east­ern side of the steppe, neces­sity forced the nomads into cre­at­ing a cent­rally-admin­istered Mon­go­lia to con­duct poten­tially viol­ent busi­ness with China in order to main­tain their exist­ence. They did not have the capa­city to fight China head-on as their exist­ence was built around their mobil­ity in small num­bers — entirely dis­tinct from the sedent­ary cit­ies of the Chinese empire. Nomad­ic groups aimed to pre­serve their mobile life­styles, yet not in conquered lands. They adop­ted an imper­i­al-style admin­is­tra­tion sys­tem where they ruled indir­ectly through boy­ars or Rus­si­an noble­men col­lect­ing taxes for them. Some argue that the arrival of the Mon­gol Empire con­trib­uted to the emer­gence and con­struc­tion of the European nation state. In con­trast, to the west of the steppe, nomads made a liv­ing not by viol­ent nego­ti­ations but by dom­in­at­ing the trad­ing net­work. These groups cre­ated the polit­ic­al frame­work for the Silk Route through policies provid­ing secur­ity to the cara­vans cross­ing Euras­ia, ensur­ing the smooth work­ing of the trade net­work that poten­tially con­trib­uted to European unity. The World Nomad Games thrives to revive, pre­serve and devel­op this unique his­tory and eth­no­cul­tur­al par­tic­u­lar­it­ies of the nomad­ic civil­isa­tion in order to foster more tol­er­ant and open rela­tion­ships between people in the age of glob­al­isa­tion and amidst the polit­ic­al and eco­nom­ic region­al trans­form­a­tions. Every two years, begin­ning from 2014, the Games take place in the lakeside town of Chol­pon-Ata, in the Issyk-Kul province of Kyrgyz­stan, although the host­ing loc­a­tion is set to change for future games. 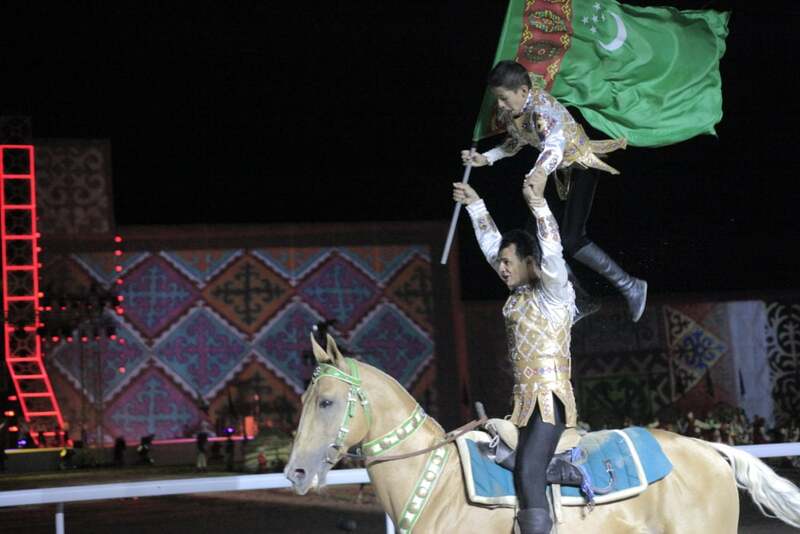 This year, ath­letes from 74 coun­tries par­ti­cip­ated in 37 tra­di­tion­al nomad games, involving horse games, wrest­ling, mar­tial arts, arch­ery, hunt­ing and intel­lec­tu­al games. The zeinth of strength and show­man­ship is found in horse game of Kok Boru (some­times known as Buzkashi). The game is described as a fusion between rugby and polo, with two teams com­pet­ing to throw a head­less car­cass of a goat into a goal at each end of the field. Tra­di­tion­ally the win­ner would take the car­cass home and cook it up in a feast. Er Ern­ish, anoth­er Kyrgyz sport, sees two ath­letes wrestle on horse­back seek­ing to dis­mount their oppon­ent. Wrest­ling is the most rep­res­en­ted sport at the Games with fif­teen dif­fer­ent types on offer from the par­ti­cip­at­ing coun­tries, includ­ing Alyh, or belt wrest­ling, where the par­ti­cipants throw the oppon­ent on the ground by grabbing their belt around their waist. 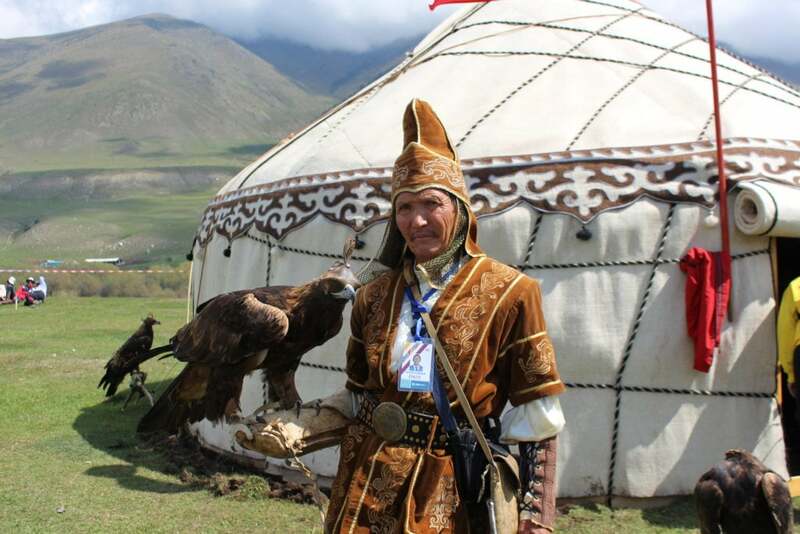 Par­ti­cipants do not only com­pete in eth­no­s­ports but also in every­day activ­it­ies of nomads, such as yurt build­ing, hunt­ing with a golden eagle (Burkut Saluu), fal­conry (Dal­ba Oynotuu), dog racing, and hunt­ing (Taigan Jary­sh). While Chol­pon-Ata hosts the sports games, the cul­tur­al base is the town of Kyrchyn Jail­oo in the moun­tains, dis­play­ing per­form­ances of Kyrgyz cus­toms, enter­tain­ment and games and those of the par­ti­cip­at­ing coun­tries. These eth­no­cul­tur­al shows intro­duce the dances, fash­ion, bazaars, and music of the nomads — embra­cing their ori­gin­al­ity and diversity. 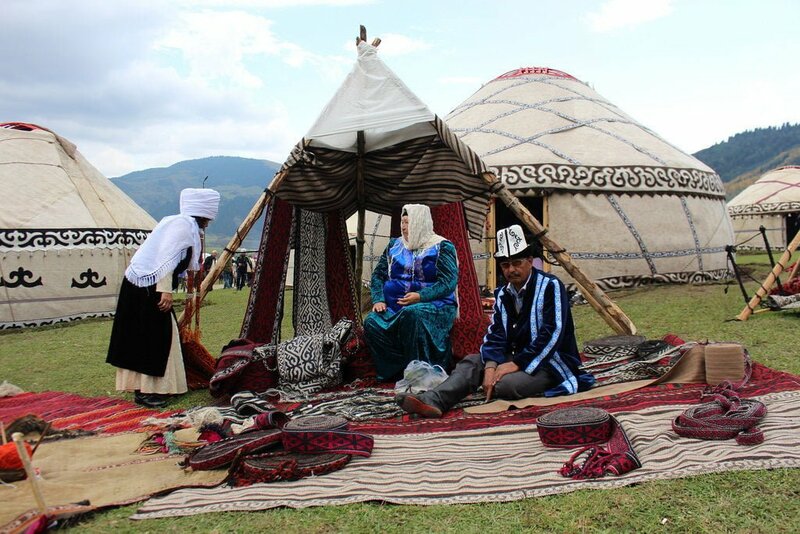 In the extens­ive yurt camp set up both by the offi­cial organ­isers and loc­al Kyrgyz fam­il­ies as accom­mod­a­tion, guests can exper­i­ence Cent­ral Asi­an hos­pit­al­ity, tra­di­tion­al cuisine, horse tax­is, and hot air bal­loon rides in the moun­tains. 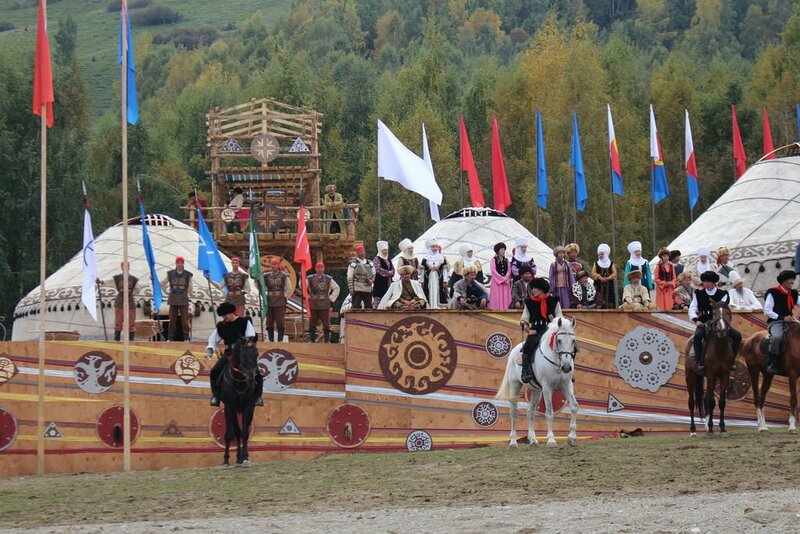 Unsur­pris­ingly, the 2018 World Nomad Games were won by Kyrgyz­stan, with Kaza­kh­stan in second, and Rus­sia on the third place. At the clos­ing cere­mony, Kyrgyz­stan cere­mo­ni­ally handed a ves­sel of gla­cial water -the totem of the Games sym­bol­ising sim­ul­tan­eously both life and the dif­fi­culty of find­ing fresh water — and the book of great win­ners to Tur­key, who will host the next Games in 2020. The World Nomad Games were broad­cas­ted all over the world in over 60 coun­tries, the sports, tra­di­tions, cul­tures and lives of nomads reached hun­dreds of mil­lions of people. With such an extens­ive cel­eb­ra­tion of the nomad­ic cul­ture and his­tory the com­ment­at­or of the second Games was right: ‘If Genghis Khan were alive, he would be here’.